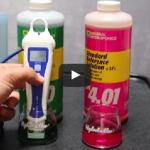 Learn how to correctly calibrate a Bluelab pH pen. pH pen calibration is fast and easy and the steps are similar among many pens. 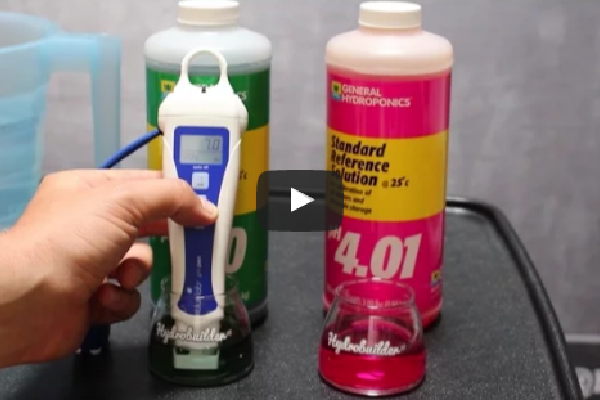 pH calibration is critical for the health of hydroponic gardens. After changing the batteries pH 7.0 and pH 4.0 solutions are required for calibration. You may also calibrate using pH 7.0 and pH 10.0 solutions if your readings will normally be higher than 7.0 pH. Excluding first use, YOU MUST CLEAN the probe before calibrating. Hydrate the probe before first use and after cleaning. After hydration, rinse probe in fresh water and place in pH 7.0 solution. Wait for the reading to stabilize. Press the cal button until CAL is displayed. Release button. When CAL 7 is displayed, 1 point calibration is complete. Rinse probe in fresh water and place it in either pH 4.0 or pH 10.0 solution (use pH 10.0 solution if you expect to measure above 7.0 pH). Wait for reading to stabilize. Press the cal button until CAL 4 or CAL 10 is displayed CAL 4 or CAL 10 should be displayed (depending on what solution you are calibrating in). The check mark/tick is displayed when a 2 point (or 3) calibration is completed. NOTE: For a three point calibration repeat the steps using pH 7.0, pH 4.0 then pH 10.0 solution. Calibration is easy and fast. The steps above are similar to how you calibrate many pens but always consult your owners manual to be certain and for care and maintenance instructions.